Industry 4.0 will make available vast amounts of data from systems and sensors in a production environment. It empowers companies to control and optimise their industrial processes to unprecedented levels. Next generation predictive maintenance tools will be early contributors. By analysing the data generated it is possible to identify early signs of machine failure. This enables users utilising effective predictive maintenance models to prevent unplanned stoppages. This alone will deliver significant financial advantages to the plant operator. 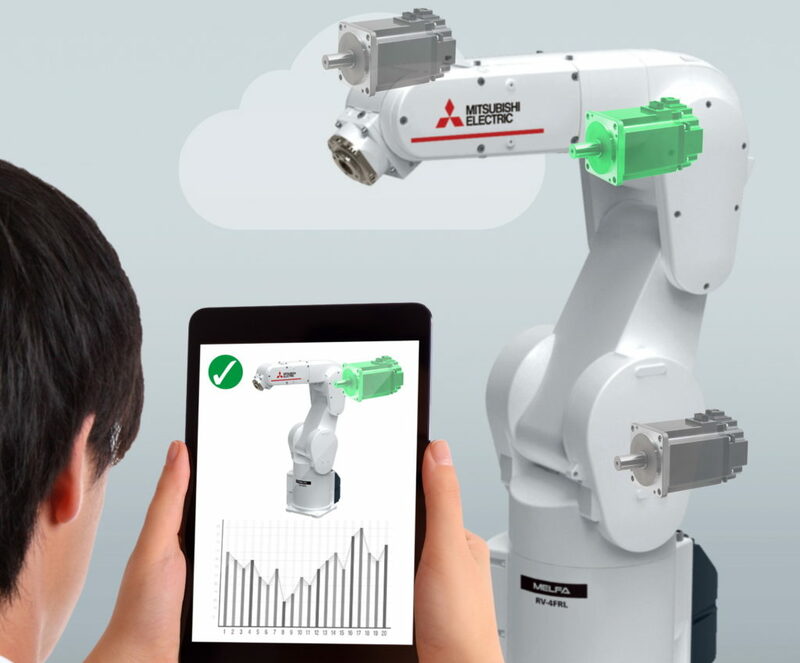 Mitsubishi Electric’s cloud-based next generation predictive maintenance tracks machine use and wear characteristics. Maintenance predictions come from an artificial intelligence platform (AI) within IBM Watson Analytics. It works by combining predictive maintenance models, digital simulation, prediction and extrapolation of trends. The result is accurate advice on machine status, action needed, and when to take it. By acting on guidance, users can improve productivity and plant control while reducing costs and unplanned downtime. Voice control and augmented reality (AR) also enhance responsiveness of connected intelligent systems. Machine data analytics is useless if not associated with an appropriate communication system that informs the human operator about the condition of the robot. An AR interface ensures a meaningful useful dialogue can take place had between humans and robots. The operator can make contact and visualise the predictive maintenance analytics and for example track a robot using a tablet computer. They can also receive maintenance information or run hands-free operations using voice commands. The robot can also report the status of a task verbally. Once an AR platform is available, using smart glasses helps operators manage and conduct maintenance works. Through them, operators receive information, such as CAD drawings superimposed on the glasses. By looking at a machine, users can receive predictive maintenance advice or receive guidance on issues or tasks to perform. The operator can be automatically provided with pop-up information to rectify the problem. Further to providing predictive maintenance, uses include training for operators or maintenance staff. Connected technology helps operators interact with machines more efficiently and learn how to use them more effectively. Finally, it can make knowledge and experience from more experienced workers available to staff across the business.